For a refresher on what Alphabet does: Alphabet is a conglomerate including Google which mainly consists of search, maps, YouTube, Chrome, Cloud, AdWords, AdSense and the Android mobile phone platform. 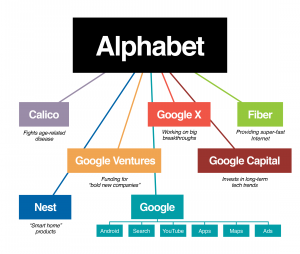 Beyond Google, Alphabet consists of mostly moonshots and investments: Google X, Calico, Nest, Ventures, Fiber, and Capital. Focusing on 2&3, we structured these companies along the industries they serve. Most companies serve one of large industries like Healthcare that are experiencing an AI revolution. 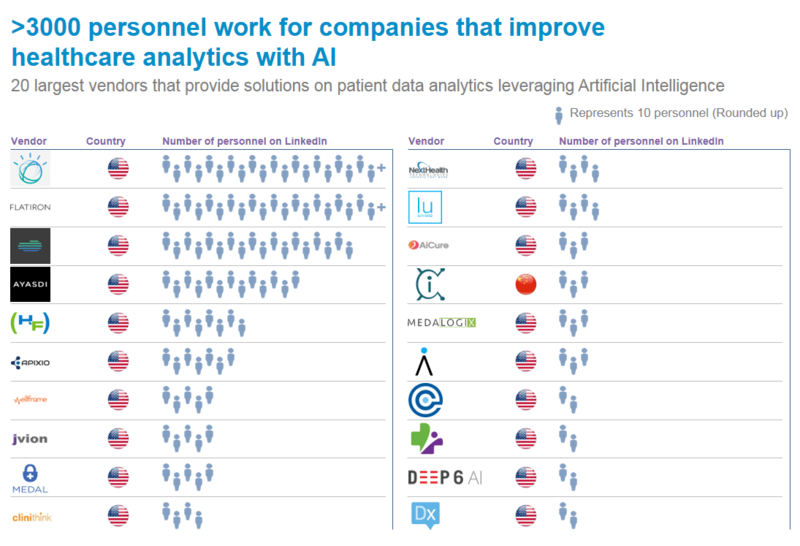 Another large group of companies are active as AI enablers. Like Deepmind or api.ai they aim to build the building blocks of AI including systems, libraries and APIs. 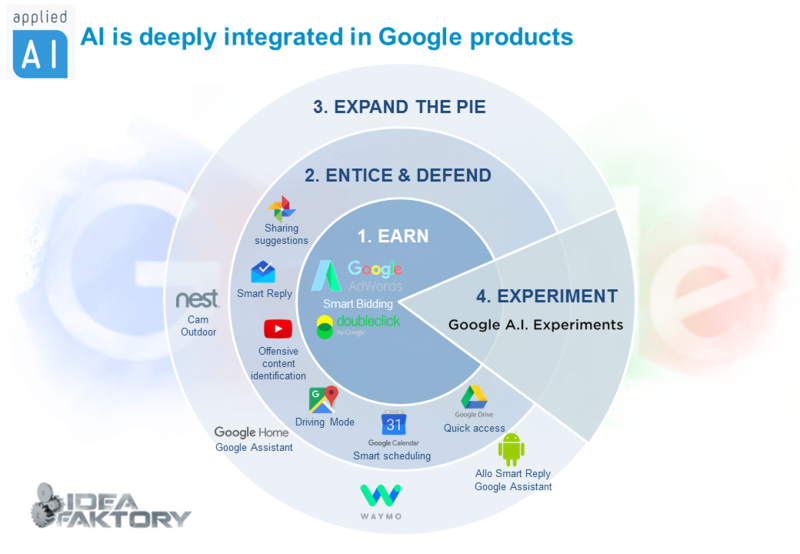 Google’s own ventures are specifically focused on AI enablers, transport&logistics and healthcare. 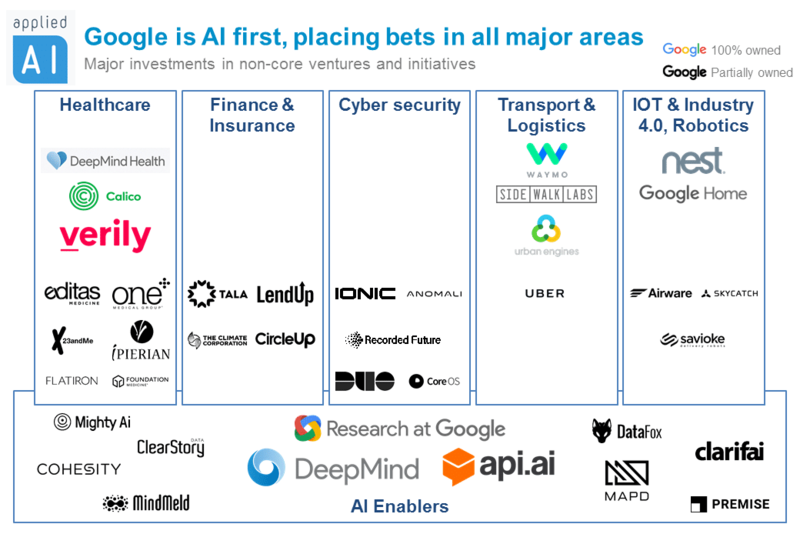 Instead of diving into all of Alphabet’s bets in the field of AI, we will first focus on Deepmind, Waymo and Nest which are Alphabet’s leading investments leveraging AI. We began applying machine learning two years ago to operate our data centers more efficiently. And over the past few months, DeepMind researchers began working with Google’s data center team to significantly improve the system’s utility. Using a system of neural networks trained on different operating scenarios and parameters within our data centers, we created a more efficient and adaptive framework to understand data center dynamics and optimize efficiency. By applying DeepMind’s ML to Google data centers, energy use for cooling was reduced by up to 40 percent. In any large scale energy-consuming environment, this is a huge improvement. DeepMind Health works with hospitals on mobile tools and AI research to help get patients from test to treatment as quickly and accurately as possible. The company’s priorities are shaped by patients and clinicians, unlike top-down IT projects that can be costly and ineffective. Nurses and doctors in that system and elsewhere simply don’t have the tools to instantly analyze each test result, determine the right treatment, and make sure that every single patient who needs complex or urgent care is escalated to the right specialist immediately. Of course, the patient security is guaranteed and data will ever be connected to Google accounts or services, and it won’t ever be used for any commercial purposes like advertising or insurance. Google is doing that by the legal and ethical way. Babylon Health, funded partially by co-founders of Deepmind lets you talk to a doctor through your smartphone. DeepMind Health cooperated with an AI-powered version of Babylon in 2016. The AI version of the app will ask the patient a series of questions about their symptoms before giving them the advice they require. Over 150,000 registered users have signed up to Babylon’s subscription health service, which allows people to have a video conference with one of the 100 doctors that are employed full time by Babylon. 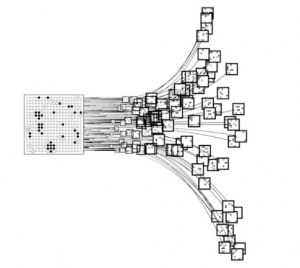 Alpha Go is a huge accomplishment in AI. The program plays Go the board game, taking turns to place stones on a board with the aim being to surround the opponent’s stones, with the winner being the one that captures the most stones. While it sounds simple it is elegant and complex and taken extremely seriously in China, with some playing it on a professional basis. Alpha Go hit the headlines last year when it beat Sedol, one of the world’s best Go players, 4-1 in a five-game match. Never before had a machine beaten a 9-dan professional, the best Go ranking available. Today, the company is concurrently pursuing research in the video game world of StarCraft II, with the aim of using a general purpose A.I. to do to Starcraft II’s top players what it did to Go’s. One of the crucial aspects of general intelligence is applying knowledge from one task to another. Deepmind team tried to tackle this problem by teaching their AI to play 10 arcade games. AI was able to master 7 of these games. While we are still probably decades from reaching Artificial General Intelligence, these are promising results. As the smart home market continues to mature, it will be critical to monitor Nest’s progress. Nest’s built-in intelligent home appliances can help Google get into more houses, and allow users to get more involved in everyday life, some of which are carried to the digital each day. Analysts are predicting that the Internet of Things will be a trillion dollar market which was one justification for Nest’s $ 3.2 billion price tag. AI is baked into Nest. When you’re on your way home, Google will work with Nest to pre-heat or cool your home to your preferred temperature. Control your Nest with your voice from your tablet or phone app. In the latest of 2016, Google announced that is no longer developing its own self-driving car. Instead, the company is said to be partnering with automakers on more conventional cars with a view to possibly launching an autonomous ride-sharing service by the end of next year. Google’s self-driving car project is based on making roads safer, free up people’s time, and improve mobility for everyone. Now, as an independent company, Waymo is more committed than ever to the same goal. The “driver” sets a destination. The car’s software calculates a route and starts the car on its way. A rotating, roof-mounted LIDAR (Light Detection and Ranging – a technology similar to radar) sensor monitors a 60-meter range around the car and creates a dynamic 3-D map of the car’s current environment. A sensor on the left rear wheel monitors sideways movement to detect the car’s position relative to the 3-D map. Radar systems in the front and rear bumpers calculate distances to obstacles. Artificial intelligence (AI) software in the car is connected to all the sensors and has input from Google Street View and video cameras inside the car. The AI simulates human perceptual and decision-making processes and controls actions in driver control systems such as steering and brakes. The car’s software consults Google Maps for advance notice of things like landmarks and traffic signs and lights. An override function is available to allow a human to take control of the vehicle. Proponents of systems based on driverless cars say they would eliminate accidents caused by driver error, which is currently the cause of almost all traffic accidents.